Besides keys, your keychain is a convenient place to keep a variety of tools from a clipper to a can opener. Since you often carry your keychain anywhere you go, attaching some useful gears to it is not a bad idea. Among those items, a flashlight to enhance your vision in a low light situation could come in really handy. But in the case you know little about market options, it’s not easy to make a good purchase. Well don’t worry, this article shall show you how to buy the keychain flashlight plus several quality samples for your consideration. There are way too many products around so it’s vital to have a clear understanding of a keychain flashlight before you head to the store. In most of the case, it must be small enough so you won’t end up with a notable bulge in your pocket. Take some time to make sure that the flashlight quality is good enough for your need and requirement. No one wants to buy something only to see it fail in a matter of days. Finally, there is a diversity of preferences and demands. That is why you have to incorporate your personal tastes into the selection process. Belong to the Ti series of ThruNite, Ti3 is among the best keychain flashlights in its price range. Using a single AAA battery, it’s quite a dependable flashlight with excellent brightness setting and fairly long runtime. 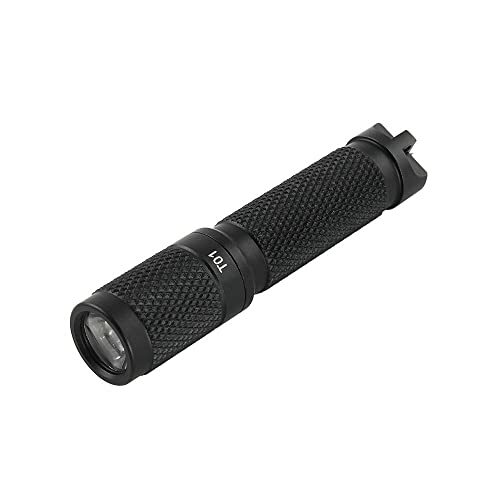 The high-grade aluminum casing is really tough, you can submerge the flashlight under 2 meter of water without damaging its internal component. To protect itself from incorrect battery installation, the flashlight possesses a reverse polarity protection system. The Cree XP-L V6 LED of Ti3 got an estimated lifespan of 20 years which make it a quality and long lasting product to have. There are 4 operating modes available at your disposal: Strobe, High, Medium and Firefly. At the maximum light setting, the Ti3 flashlight can deliver a 130 Lumen beam out to a distance of 50 meters, good enough for a keychain flashlight. To change between the modes, all you have to do is to rotate the head. Do keep in mind that running the flashlight on the brightest levels like High and Strobe significantly reduce the battery life. The convenient snap hook on the tail section permits you to detach/attach the flashlight whenever you like. 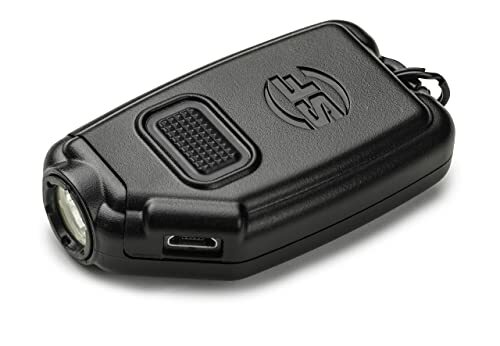 This is one of best keyring flashlight that you should purchase. Want a bright and beautiful keychain flashlight? Then perhaps you should take a good look at Surefire Titan Plus. While humble in size, the use of nickel-plated brass gives it a high level of resistance to scratches and corrosions. Besides the flashlight, you shall receive a removable pocket clip for secure carry. However, you can always pass over the clip and hook the Titan Plus to your keychain using the eyelet on its tail. In term of size, the flashlight is a bit bigger and heavier than its predecessors but the increases are often negligible nonetheless. With a maximum light output of 300 Lumens, the Titan Plus flashlight could illuminate a wide area. The purchase also includes a rechargeable AAA battery as well which should sustain the flashlight for 1 hour on the High operating mode. To charge the battery, you have to invest more money since the charge is sold separately. Other light settings consist of Medium (75 Lumens) and Low (15 Lumens). 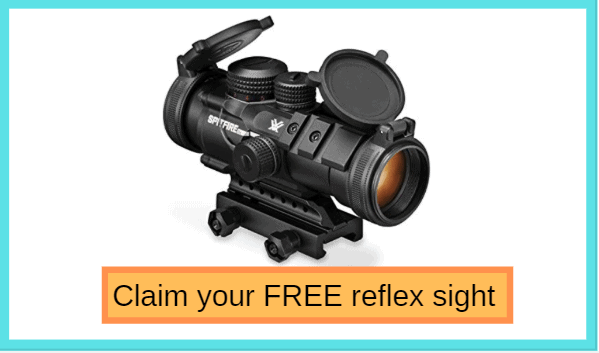 The Max Vision technology researched by Surefire ensures a wide and equally distributed beam on every mode. 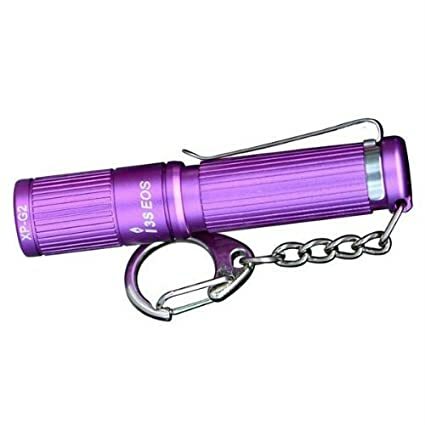 This is a best edc keychain flashlight that you can choose. Portable and durable, Nitecore TIP is a perfect flashlight to light up your vision in a low light environment. 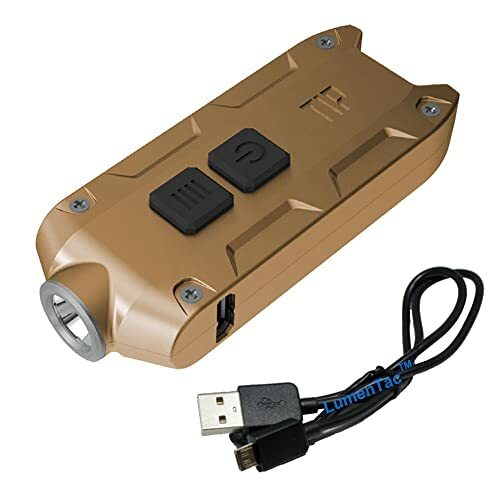 While it only uses 1 Li – On battery, the flashlight is able to reach a maximum light output of 360 Lumens. There is a memory function as well, it should remember the last setting you use until the next time you turn on the flashlight. Same as other modern designs, it employs a USB charging port. You can plug it in and recharge the battery whenever there is an electric outlet or a power bank nearby. The presence of a regulator prevents issues like overheat or overcharge. Because of its polycarbonate casing, TIP is capable of withstanding 77 pounds of weight and 1.5-meter drops. It’s also waterproof as well so it could come into contact with water and come out totally operational. With up to seven color option available, you can go after the one that suits your taste the most. In the brightest operating mode, the flashlight is able to project its beam out to a maximum distance of 77 meters. A metallic ring is there to let you attach the flashlight to your keychain. Featuring compact sized body and powerful LED, SureFire Sidekick can be used by adult and children alike without any problem. The tiny flashlight possesses excellent light settings which make it a good choice for illumination compared to your phone. It employs a convenient micro USB charging port that is compatible with wall and vehicle charger. While other products require you to get the battery out of the flashlight to charge it, Sidekick let your charge the battery directly through the port. The quality of the Li – On battery is top notch, you can recharge it repeatedly for the next 7 years without fail. 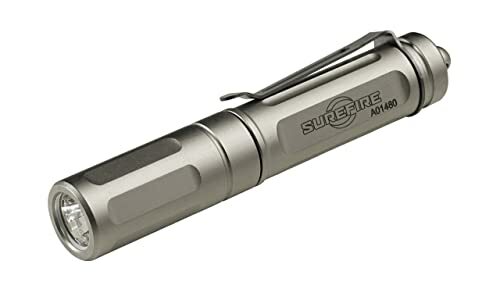 Similar to other SureFire flashlights, Sidekick makes good use of the Max Vision technology to produce bright and wide beam out to 50 meters There are 3 operating modes for you to chose: High, Medium and Low. The estimated runtime may vary from 1.25 hours to 45 hours, depending on the user habit and light setting. To cycle the modes, the flashlight employs a basic click type switch, you can change the default mode sequence if you want to. There is a simple metal clip for you to attach Sidekick to your keychain. When you charge the flashlight, it shall go into beacon mode. The beeping light could be annoying at times but make it easy to locate the Sidekick flashlight in the dark. Using aluminum and stainless steel in its construction, K18 holds up together very well in harsh environments. Due to the durable outer casing, the internal parts are well protected against water and impact force. Its surface is slip resistant so you can hold the flashlight tightly and conveniently. To prevent overheat, K18 employs innovative thermal path with copper aid that considerably enhances the heat dissipation rate. For energy source, K18 is able to accept 10440 or AAA though your battery choice would affect the flashlight brightness potential. This is a best aaa keychain flashlight that you can’t miss. With a 10440 battery, the flashlight highest light output should be around 370 Lumens. On the other hand, using an AAA battery result into a much lower maximum brightness with 110 Lumens the norm. A reverse polarity protection is in place to protect the flashlight from battery installation mistakes. There is a switch lockout feature to conserve battery and avoid accidental activation. Click the switch twice in quick succession then turn off the flashlight to engage the lockout. Since the K18 tail is completely flat, it’s capable of standing upright on it own. Compact and smooth, Olight I3E is a slim keychain flashlight that can easily slide into a pocket or a bag. As small as it is, the flashlight pack a relatively nice beam. There are 6 colors options: Silver, Red, Black, Purple, Green and Blue. The Silver version got a maximum output of 120 Lumens while others possess around 90 Lumens. Since the outer casing of the flashlight is rather smooth, it should not wear down the fabric interior of your pocket and bag. With the 19.4 gram weight, you can hardly tell the I3E presence while carrying it. Running on a single AAA, the flashlight could last for approximately an hour, depending on your battery type. The farthest distance its beam is able to reach is roughly 44 to 48 meters, adequate for a flashlight of its size. For the LED, Ỉ3E uses a long-lasting Philips LUXEON TX with an estimated lifetime of 60,000 hours. Along with the premium quality PMMA TIR lens, the flashlight produces a bright and powerful beam. On the tail cap is a handy key ring, you can use it to secure Ỉ3E to a keychain in no time. 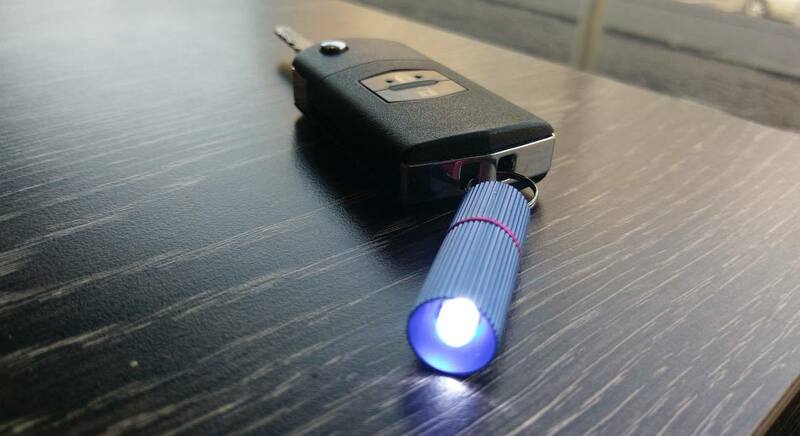 Because of its limited dimension, the keychain flashlight often uses a compact battery as its energy source. Thanks to the technology advancement, the battery life of small-sized batteries is fairly nice compared to their size. There are 2 types of battery: Disposable and Rechargeable. Disposable batteries are cheap to get at first and simple to use but not exactly an economical choice in the long run. While their acquisition cost could be considerable, rechargeable batteries let you use them repeatedly, therefore, the flashlight overall expense is substantially reduced. As with their standard size counterparts, keychain flashlights primarily utilize 2 beam types: Spot and Flood. Spot beam illuminates a small area at a far distance while the flood beam is the complete opposite of the spot beam. In term of purpose, people tend to use the spot beam for tasks like route finding, utility work, search and rescue, etc. On the other hand, the flood beam is suitable for general uses such as reading, walking, repairing and so on. Common LED keychain flashlights usually utilize an adjustable beam. That means you can easily switch between the spot beam and the flood beam depend on the situation. Measured in Lumen, the brightness level of the flashlight largely influences its effectiveness on the field. Of course, the light output of a flashlight is closely connected to its battery life and operating mode. Multiple light settings lead to a variable estimated runtime for the flashlight. The runtime is calculated by measuring the time it takes for the light output to drop below 10% of the designed capacity. Technically speaking, using the flashlight on the higher mode always drain the battery at a much faster rate compared to the lower ones. Given the flashlight profile, there is a good chance that you could drop it to the surface below by mistake. Therefore, it must have a certain level of resistance against impact force plus other stuff like water and corrosion. The material of the outer casing is going to be an important factor to consider here. It will decide the structural integrity of the flashlight and its overall resistances. However, you still have to take into account the weight of the material, you don’t want to let the flashlight weight down your pocket. And those are some of the best keychain flashlights available for purchase, anything catches your attention? It’s could be really tough to make a logical purchase when you know little about market options. But with the help of this article, you should have little trouble securing a suitable product for yourself.